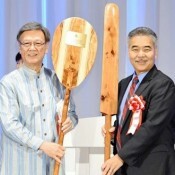 The 30th anniversary ceremony of a sister-state affiliation between Okinawa and Hawaii was held on the evening of October 9 at the Loisir Hotel & Spa Tower Naha in Naha. 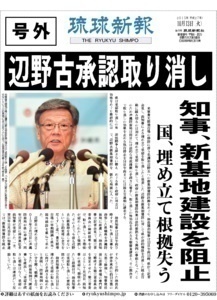 On the morning of October 13, Governor Takeshi Onaga revoked his predecessor’s approval of landfill for a new U.S. base in Henoko, Nago. 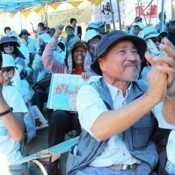 Sit-in protestors in front of Camp Schwab U.S. Marine Base at Henoko rejoiced at the governor’s announcement. 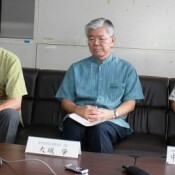 Ten presidents of universities, colleges and a technical junior college in Okinawa sent a joint letter to the Prime Minister and Foreign Minister at the end of September, asking for halt of the flight of U.S. military aircraft over the campuses. 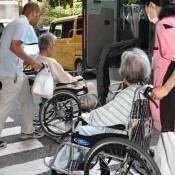 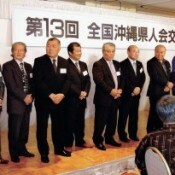 The 13th national Okinawa Kenjinkai exchange meeting was held on October 3 in Tokyo. 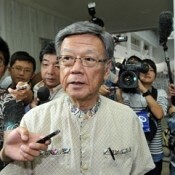 About 230 representatives from 18 organizations and Okinawa Governor Takeshi Onaga attended the meeting.